Ray Nettles played football at the University of Tennessee and he was drafted by the NFL’s Miami Dolphins in the sixth round of the 1972 NFL draft. He decided to come north to continue his career as a member of the BC Lions. Nettles started his tenure as an Outside Linebacker but was later moved to Middle Linebacker. He became known as much for his colourful off field personality as for his on field feistiness. He was named All-Western three times and All-Canadian twice. In 1973, he won the Schenley Award as the most Outstanding Lineman after winning the Demarco-Becket Memorial Trophy as the top lineman in the Western Division. 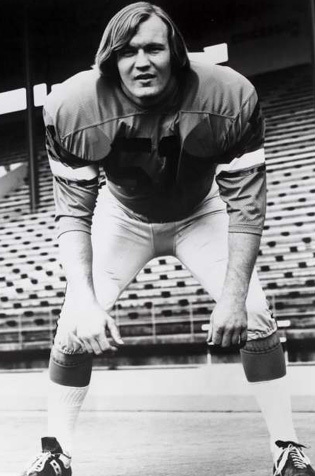 Nettles was traded to the Toronto Argonauts in 1977, where he was named Toronto’s Most Outstanding Player as well as All-Eastern. In 1978, he was again traded, this time to the Hamilton Tiger-Cats where he was named All-Eastern for a second time. He completed his nine year career with one year stints with the Ottawa Rough Riders in 1979 and the Calgary Stampeders in 1980.